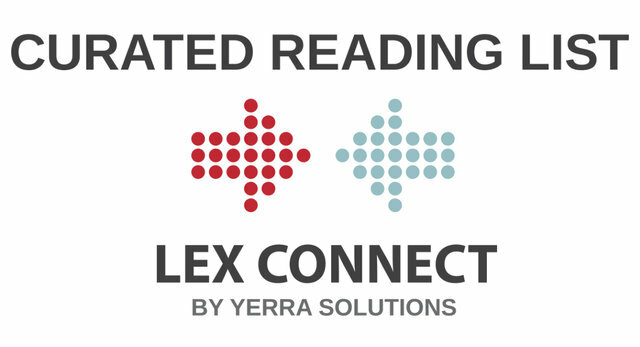 To receive the Lex Connect Curated Reading List directly into your mailbox, click subscribe. Legal Procurement is unlike 99% of Procurement in other, non-legal industries. Lawyers (sell-side) and legal departments (buy-side) often have long-standing relationships that are not easy to quantify or put into a scoring matrix. Legal issues can often be very niche and complex, requiring specialist or expert skill sets. These issues were at the forefront of my mind when I had the chance to listen to the recent Buying Legal Counsel call on unique processes for sourcing legal matters. When stock picking, investors look at a combination of factors: technical and fundamental analysis, expected dividends, corporate governance, rumours, to name but a few. But in the digital economy, data has very quickly become an asset class investors must consider. Observe the top ten companies in the world by market capitalisation, from Facebook to Alphabet and most in between, their greatest asset is data. As organizations demand more from their legal teams, in-house counsel can look to innovative technologies to help them become more productive. Many of these tools focus on removing menial, time-consuming work so counsel can focus on higher-value judgment tasks and spend resources more effectively. eDiscovery is tough in English. Adding foreign language increases the difficulty and complexity by magnitudes. This paper offers guidance on three key challenges of multilingual eDiscovery: logistics, linguistics and culture. By understanding how these areas come into play on multilingual legal matters, global working groups can better equip themselves with the people, processes and tools necessary for successful execution. A business is, in essence, a vast collection of knowledge and information. It's what's behind the creation of benchmark products and services, and it exists as a web of insights and ideas shared by staff. It's in your documentation—your manuals, guidelines, lists, databases, memos, and files. And it's also in the minds of your team members, as the expertise you need to capture to enhance your business. Knowledge is power, and when properly harnessed, it fuels a successful company. Organizations operate in a competitive, customer oriented world and need to be able to respond quickly and accurately to consumer inquiries. A key to being able to aptly service your customers is being highly organized and efficiently structured. Document management and administration tasks are often undervalued, but here we take you through the value and absolute necessity of a well organized document management system, or DMS. Kroll’s latest annual ‘Anti-Bribery and Corruption Benchmarking Report’ revealed a marked upshift in the importance of reputational risk. In this year’s survey, reputational concern has now become the top reason third parties fail to meet an organisation’s standards, overtaking dealing with sanctioned entities, involvement in opaque corporate structures, and exposure to politically exposed persons. In a legal sense, discovery is exactly what it sounds like. Both parties to a lawsuit are permitted to discover information regarding the case. If Paul Plaintiff is suing Dan Defendant in a civil suit, Paul might have records in his possession upon which he's based his complaint against Dan. Dan wants to know what those records are. He doesn't want to take Paul's word for it about what they say. He wants to see them himself, and he's entitled to by law. So much has happened, so much legal tech innovation has taken place, so many inspiring people have come forward as AI pioneers. And because of this the legal world is a little different today, though far greater changes are to come. The term AI may be exploited in legal in present, but AI technology can be part of a revolutionary future—if there are some fundamental shifts, says Aditya Prakash, CIO at Yerra Solutions. “Big Data” was the big thing in legal a few years ago. We all remember the major hype. The fact was that Big Data in legal usually equates to a “pretty large” data set. It also usually has just a single dimension (costs). Truly, it is an insult to genome scientists to use the term Big Data when referring to legal data.